Most people purchase their household broom at a grocery or hardware store, never giving thought to its history as a craft. But before 1845, when the first broom-making machines went into production in the United States, individual attention was given to almost every besom created from the then-abundant broomcorn crop. The son of a master artisan, Marlow grew up in Big Sandy Mush believing everyone made brooms. His father Ralph Gates, a former NASA employee, quit his job to apprentice under Gatlinburg, Tennessee, master broom maker Lee “Pop” Ogle. Striking out on his own, Ralph was one of the first in the country to create art brooms. Marlow worked with his father until his passing in 2004. He began making brooms at age five and was a recognized journeyman by the time he was 12. In the workshop and while traveling to art shows with his parents, Marlow grew to see the value in the disappearing craft he now practices. He studied design at North Carolina State University, and after graduation, returned home to continue his father’s craft as one of a hundred or so broom makers left in the United States. This specialty and the quality of his work have given Marlow a place in many galleries across the country, including Ogden Museum of Southern Art in New Orleans and North Carolina Museum of History in Raleigh. The old general store in Big Sandy Mush serves as Marlow’s workshop, where each one-of-a-kind besom is crafted with care and expertise. Marlow and his wife, Diana, use fallen wood as their inspiration for the organic designs. Limbs of various trees are collected during the winter and dried for several months before each is cut, carved, and sanded to make a handle. “We let the wood decide what shape the broom will be,” says Marlow. 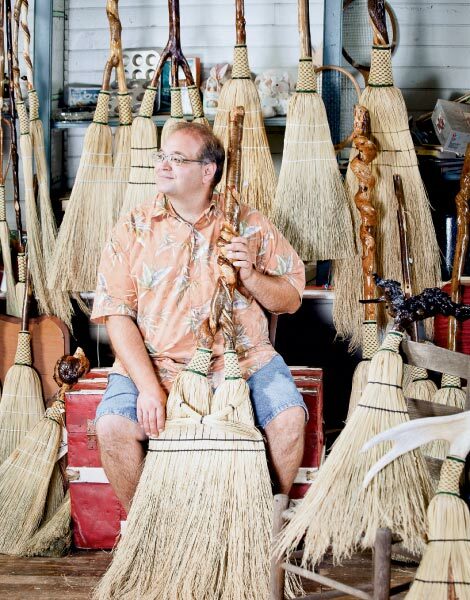 “Nature really does all the work, we just show it off a bit.” It’s also not unusual for customers to provide sentimental pieces of wood for custom brooms. Occasionally, the shafts are made from other materials such as driftwood, deer antlers, cow jawbones, and even bicycle handlebars. There are many steps in the construction process, from sorting the broomcorn to lacing the intricate patterns that hold the bristles together to spreading, or flattening, the head of the broom. And when finished, Marlow signs each handle and tags his work with the Gates’ lifetime guarantee that promises to retie the broom when it finally wears out. On the back of the card is a hand-written description of the wood and where it was found so the owner may know the history of the piece. When not in the studio, Marlow and Diana travel the country to display his brooms, their 10 and five-year-old sons, Corbin and Jayton, in tow. The boys have both learned the craft and are quite good at it says Marlow. “I tell them they can do anything—become doctors or lawyers—but they at least need to learn to make brooms first.” And so the tradition carries on. Visit Marlow’s shop, Friendswood Brooms at 8 Willow Creek Road in Leicester. To place an order, call (828) 683-9521 or visit www.friendswoodbrooms.com.